Anjali Menon's "Bangalore Days" is a fun-filled, entertainer. It revolves around three cousins whose lives change when they shift to Bangalore. The film is directed by Anjali Menon who has worked in films such as "Ustad Hotel" and "Manjadikuru." If you have seen the two movies mentioned here, you will have high expectations from Bangalore Days. You won’t be disappointed. Not one bit. So, what makes this such an engaging movie that we can connect with? It is not the actors, actresses, the music (nothing refreshing, tried too hard to sound officially retro! ) or even the story line. It’s the emotional edge, the reality tucked into dialogues, expressions and situations. "Bangalore Days" revolves around three cousins Arjun (Dulquer), Kuttan (Nivin Pauly) and Divya (Nazriya Nazim). Besides the lead actors, the film also includes Fahadh Faasil, Isha Talwar, Nithya Menon and Parvathy Menon in good roles. significant roles. Other supporting actors who add a ‘zing’ factor to the film include Sajid Yahiya, Vijayaraghavan, Prathap Pothen, Kalpana and Praveena. The supporting cast is near-perfect. Like most cousins, the three cousins share a close bond since their childhood though their parents are at loggerheads, typical as it would be in any family. As they grow up, their relationship becomes stronger and firmer. When they all move to Bangalore for various reasons, the story takes you through how their life in Bangalore changes them. So, this brings us to a question – can cities change people? Bangalore Days indicates a clear YES! The change is not merely a surface change but one that brings forward a deeper, emotional connect. Admit it, haven't you changed when you moved from the city of your birth to the city of your choice? That change is beautifully rendered in Anjali Menon's 'Bangalore Days' and it even resonates with the supporting characters because when children change their ways, the parents change too. Bangalore Days brings to life this beautiful, bitter sweet metamorphosis we go through while embracing maturity and adulthood. You begin to feel happy when ‘Cute Kuttan’ loses his heart to this cool , half-Malayali girl whom he spends the night with……playing Antakshari, by the way. He is the decent Malayali guy whom every girl would secretly love. Admit it, you would, despite the oil-slicked hair, the hesitation and a slight lack of confidence, you will like him. Because good guys can never be not liked. Even by the so-called, self-glorified bad girls. Then there is Kunju, whose proper name is Divya (starring Nazariya). She is the girl-next-door with dreams and aspirations but she is quickly married off before she can make her dreams come true. All because the family astrologer says so. Don't smirk. Education and literacy, by the way, has nothing to do with common sense. You probably know that already! Divya finds a way to see a silver lining in every struggle after marriage. There are some lovely moments in the film but I felt that Nazariya did not do justice to the character ‘Divya.’ This is because she looks, moves and behaves like a much pampered child (not even a teen!) than a woman. Nazariya’s acting feels like she is acting and trying too hard. There is Kunju’s ‘restrained’ husband (starring Fahad) who is so work-focused, restrained and still not recovered from a past relationship that you want to throttle him for his insensitivity. The way he eats, drives a car, moves around the house –everything reminds you of an intolerant perfectionist. Fahadh, being a fine actor, gets the nuances perfect too. These three cousins have their weaknesses that make them deeply vulnerable, flawed people but they strike a chord with us – the audience – because we have them too. But at the end of the film, there are two impressive actors whose performances still linger in your mind. It is Nivin Pauly and Parvathy Menon. 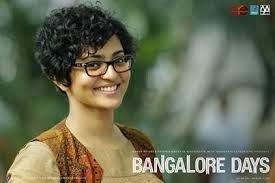 There is tremendous maturity displayed in Parvathy Menon's acting, voice rendering, dialogues and expressions – the sparkle in her eyes, the mischief in her smile, the pain in her bubbly voice and the love she feels for a man whom her mother would obviously disapprove of. She makes you feel raw, exposed and you know you may have felt all of these things at some time too. What makes RJ Sarah stand out is that she does not play the victim, she carries herself with remarkable exuberance as a real star – confident, intelligent and poised. And she is in a wheelchair. Who cannot but fall in love with her portrayal of RJ Sarah? I LOVED it! Sometimes a movie goes beyond what it conveys. It becomes a part of what you feel during and after you have watched it. So, that’s one more reason to go and watch Anjali Menon’s “Bangalore Days” – it rocks! P.S. Take all your cousins with you. They will love you for it. loved the movie through your review. I will try to watch this. NGDCs .. Me too saw that movie .. didn't seem that impressive as expected compared to Anajali Menon's Kerala Café story .. but then interesting concept adapted on "Anthakshari" .. Makes me think about strategically deriving out what all can be the threads and contours of a Super Structure on Perpetual Dating Relationship with Polygamy (without any commitments..) .. entertaining to the extent mutually beneficial with multiple relationship fronts .. Probably to have it in Practice other than Meta level perhaps Laws on Live In relationships also might need to be more explicit .. Polygamy aspects in Dating discussed in the movie (.. probably it was also shown in the English Movie Original Sin with the lead actress Angelina Jolie.. but then there probably extending beyond "Anthakshari" in Physical World creates a lot of problems with such a theme ..) with "Anthakshari" or even "Zen Thiruvathira Kali" etc maybe something 2 think about .. In original classical dating relationship themes too physical relationship is prohibited .. For that the institutions like marriage etc are perhaps provided 2 reduce the probable conflicts .. Maybe Muslim Community some how incorporates the aspects of polygamy into their system with easy divorces .. but conventional Christian Systems may want things in some Black and White Terms .. your review prompted this rant .. just for some funny analogies only .. Didn't like the movie.. Ustad Hotel was so much better. This was just an airy movie with too many plots. Wasnt as good as all the reviews claim..